A lot of people believe you must never cross a continuous centre line. But that's not the rule. You certainly can't overtake when there's a continuous centre line and you can't do a U-turn across one. But you are allowed to cross a continuous centre line if you are entering a road or leaving a road. Even if there's a broken line on the other side, you're still permitted to cross the continuous centre line if you are entering or leaving a road. But remember, if there's a double continuous centre line, you're not permitted to cross it at all. Similar rules apply to painted traffic islands. If the island's surrounded by one continuous line, you can drive on or over it for up to 50 metres in order to enter or leave the road, or to enter a turning lane that begins immediately after the island. 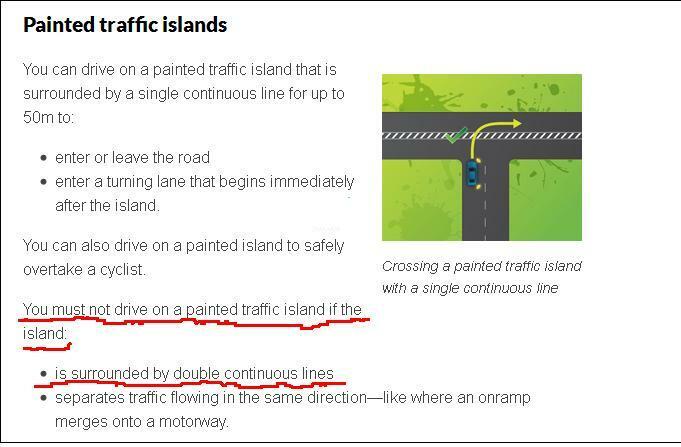 But if the island's surrounded by double continuous lines, or if it separates traffic flowing in the same direction, like where an onramp merges on to a motorway, you must stay off it, unless you need to avoid an obstruction. Doing it the right way is easy when you know how. However if the island is surrounded by double continuous lines, or if it separates traffic flowing in the same direction  like where an onramp merges onto a motorway  you must stay off it unless you are safely passing a cyclist. 139 (4) = To avoid an obstruction. 139A(3) = Exceptions for passing bicycle rider. The penalty unit value in Queensland is $113.85 (current from 1 July 2014). WHAT DID THE POLICE SAY????  Can lawfully turn right into the service station, over the single solid line.  Can lawfully turn left into the corner shops.  Are prohibited from turning left into the corner shops, due to the straight arrow markings.  Are prohibited from turning right into the corner shops due to the double solid lines at the tail of the traffic island.  Must turn left from the driveway onto Bennetts Road, as it is unlawful to cross double solid lines.  Can lawfully turn left or right onto Bennetts Road. The photos/photos from video below were taken over less than 30 minutes on 17 April 2015. Using a Sony DSC-HX60V camera. Taken at 20MP images with time/date and GPS settings. Most number plates can be read from original uncompressed photos. 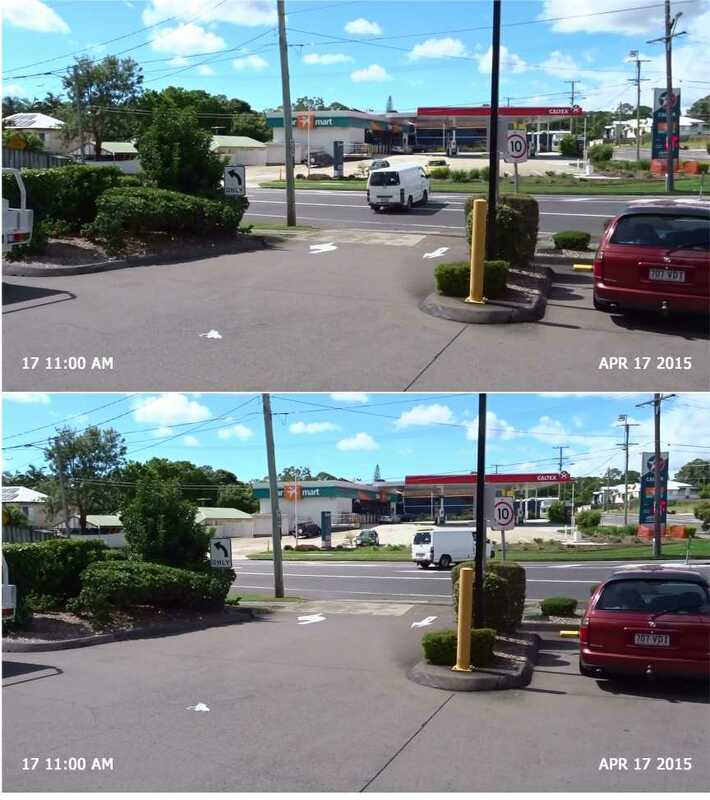 Below is a set of photos from video showing white car crossing from the right lane with 3 marked arrows which does not allow traffic to turn into this shopping complex. 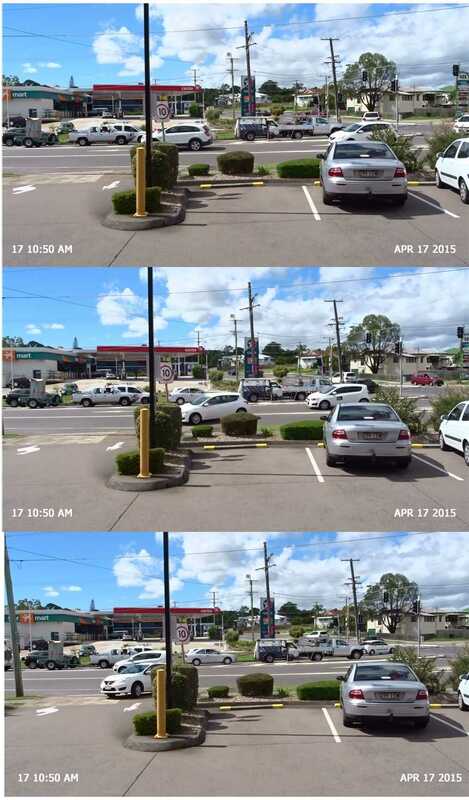 Below is a set of six photos from video showing two vehicles crossing from the right lane with 3 marked arrows which does not allow traffic to turn into this shopping complex. The owners/agents of the corner shops remarked their driveway with a LEFT arrow after my approach to them in 2007 and installed a Turn Left Only Sign. 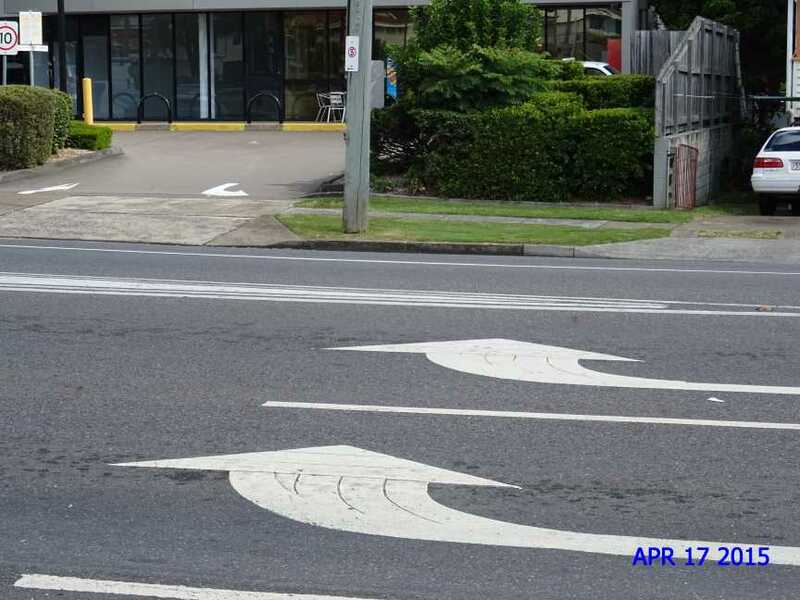 A view of the double line markings extending from the traffic island looking north along Bennetts Road Coorparoo. 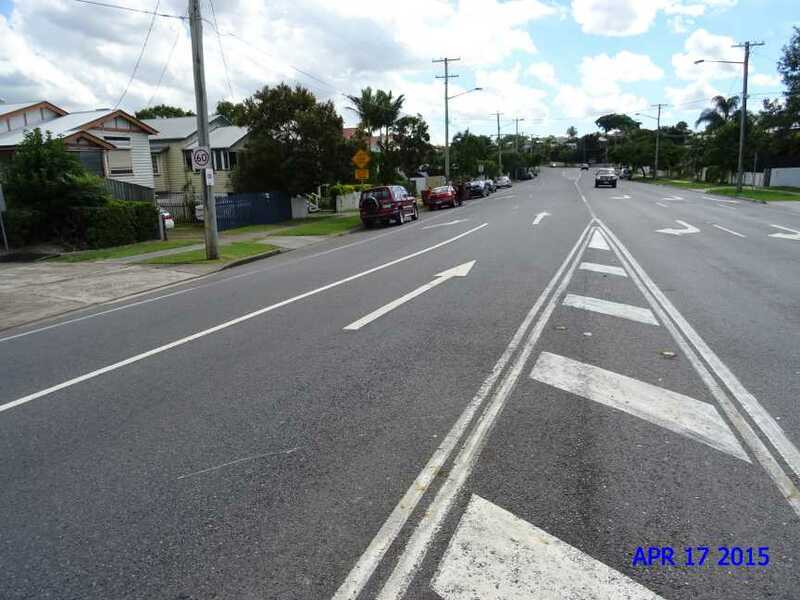 Another view of the double lines from the traffic island on Bennetts Road Coorparoo. This is a view of the extent of the double line markings past the driveway of the corner shops in Bennetts Road. WELL PAST THE DRIVEWAY ENTRANCE. A right turn into the shops at this point must be across double lines or driving on the wrong side of the road to avoid the double lines. Press to see more photos. 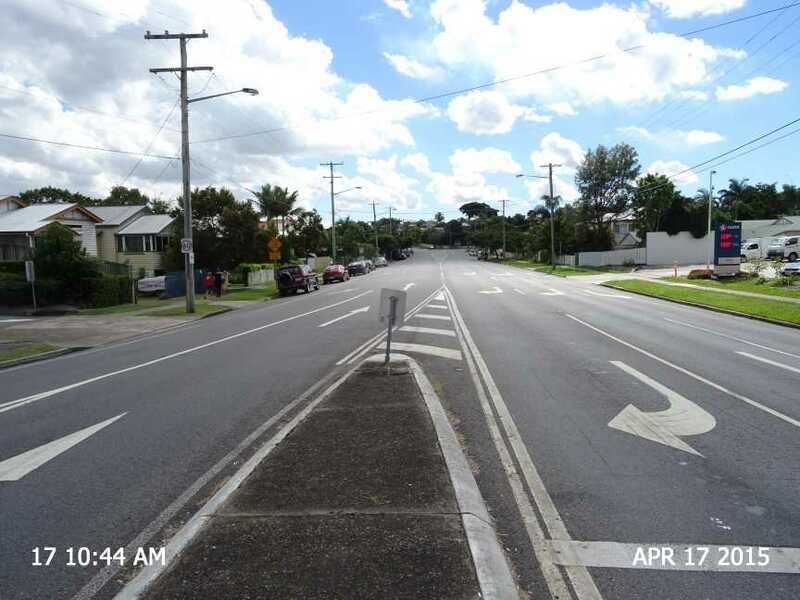 Background: Over the past several years I have observed car drivers ignoring double white lines road markings in Bennetts Road Coorparoo (Brisbane, Queensland Australia) at the intersection with Old Cleveland Road. 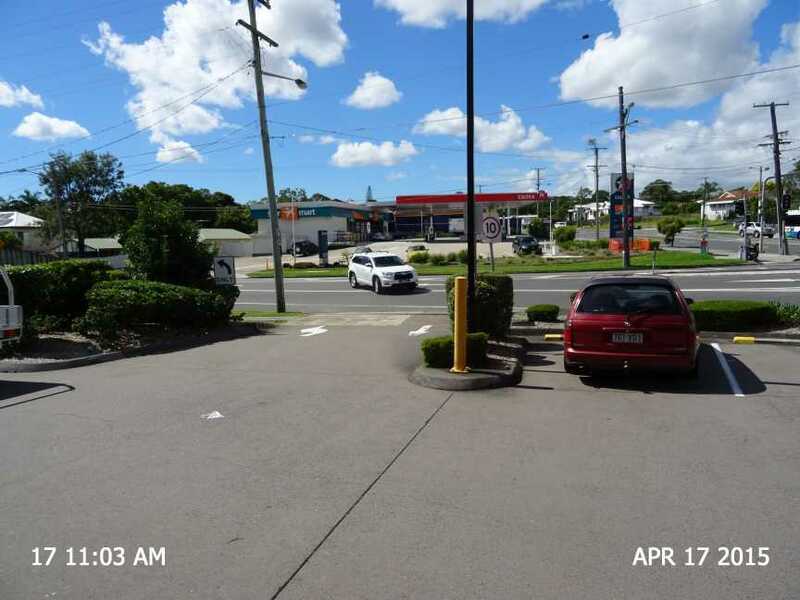 In the first instance I made a complaint with the near by local police station at Camp Hill only to be told that due to the double white line markings on Bennetts Road being over the crown of the road they were not visible to drivers exiting a corner store shopping centre and therefore any infringement tickets which were issues could be successfully challenged in court. 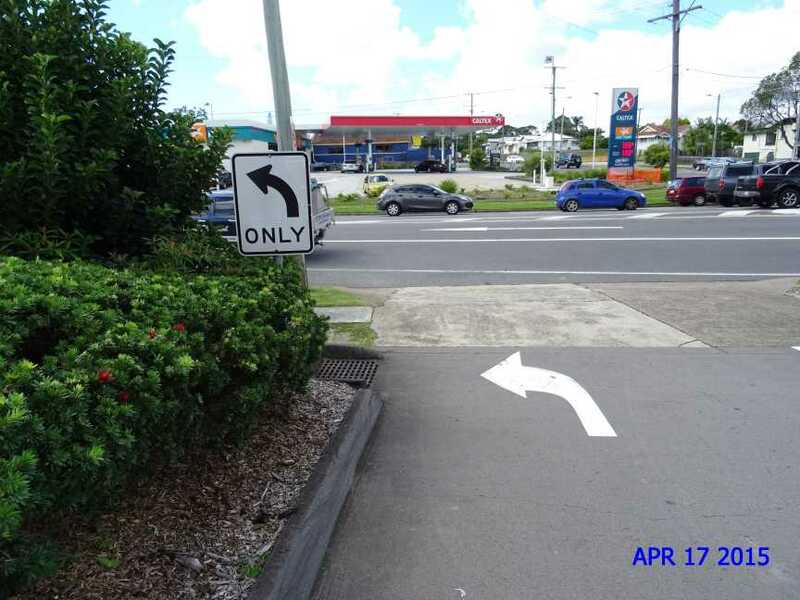 I then phoned the Brisbane City Council traffic engineers and raised the issue that the police could not enforce their decision not to have vehicles exit the corner store with a right hand turn into Bennetts Road. 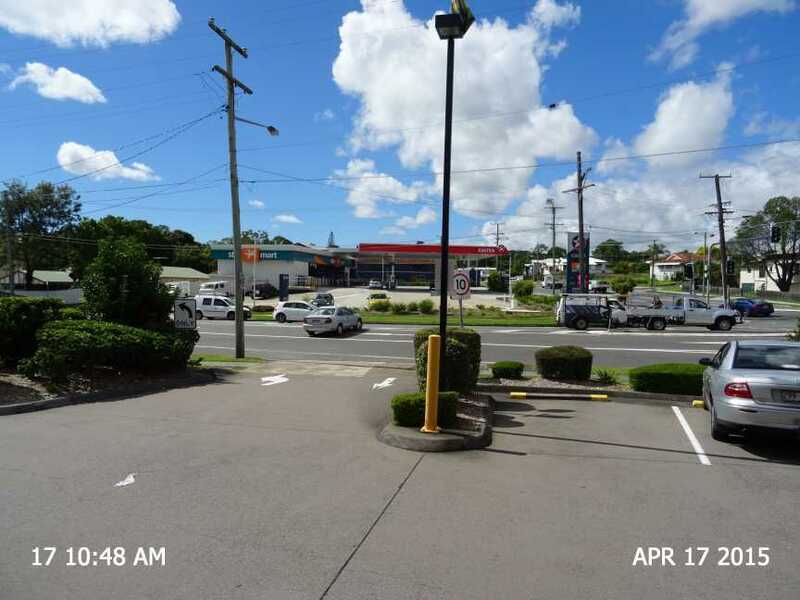 Subsequently a second set of double white lines were painted on Bennetts Road which were clearly visible to drivers exiting the corner store several years ago. 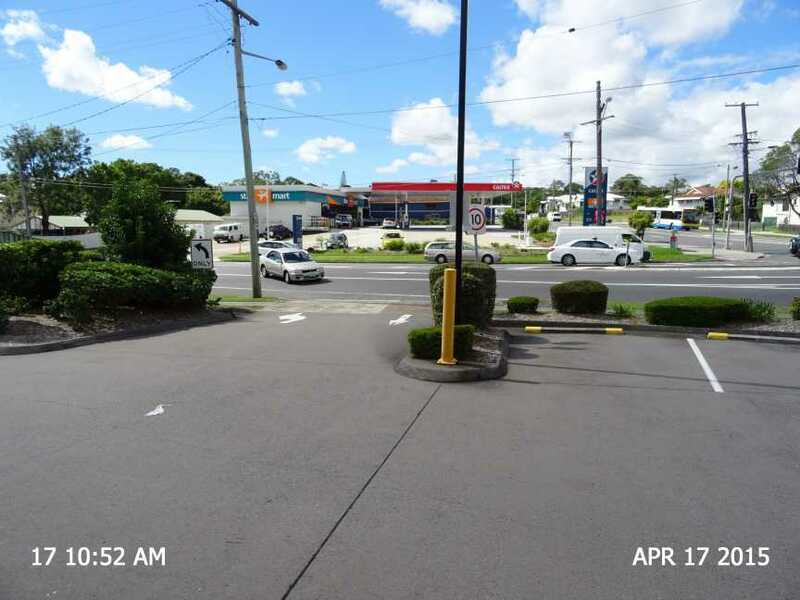 Since this time I have occasionally made complaints to both Camp Hill and Coorparoo Police Stations about the number of vehicles which enter and exit the corner store via a right hand turn across two sets of double white lines. Early in 2007 I was involved in a minor accident with a motorist exiting the corner store and immediately attempted a U-turn around the end of the double lines. Due to the cost involved in repairs to the motor vehicles the Police Department do not keep a record of such accidents therefore Police statistics do not account such accidents. At this time I decided to become more proactive in attempting to have a resolution to the continuing breaches of Queensland Traffic Regulations. 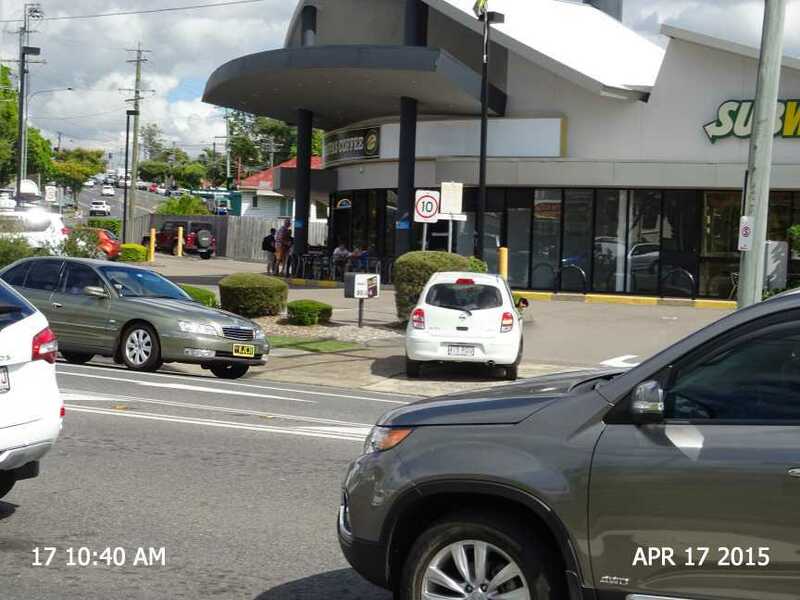 I have had several phone conversations with the Police Traffic Branch at Upper Mount Gravatt during 2007 and I have been given little satisfaction but many excuses as to why enforcement is difficult if not impossible at this intersection. 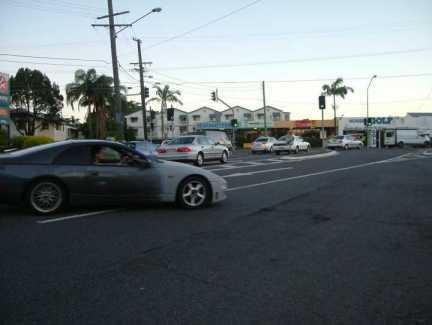 I arranged a meeting on 18 January 2007 with my local Brisbane City Councillor for Morningside and as the intersection is the border between the two electorates (wards) I also spoke the other councillor as well on 20 March 2007. Well what a waste of time! I also spoke to the Councillor for Traffic and Transport on 20 March 2007 and 5 1/2 months later I received a copy of a memo that he had just sent his department about what I had spoken to him about 5 1/2 months earlier at a Council meets the community meeting. I did try make an appointment to meet with him in person prior to March 2007 but I could not get his Bloody Assistant. I have had it in mind for several years to sit adjacent to this site all day one day and take photos and video footage before I was willing to make a written complaint. On Friday evening 7 September whilst accompanying my daughter home, we witnessed four vehicles cross the two sets of double white lines in less that one rotation of the traffic lights. 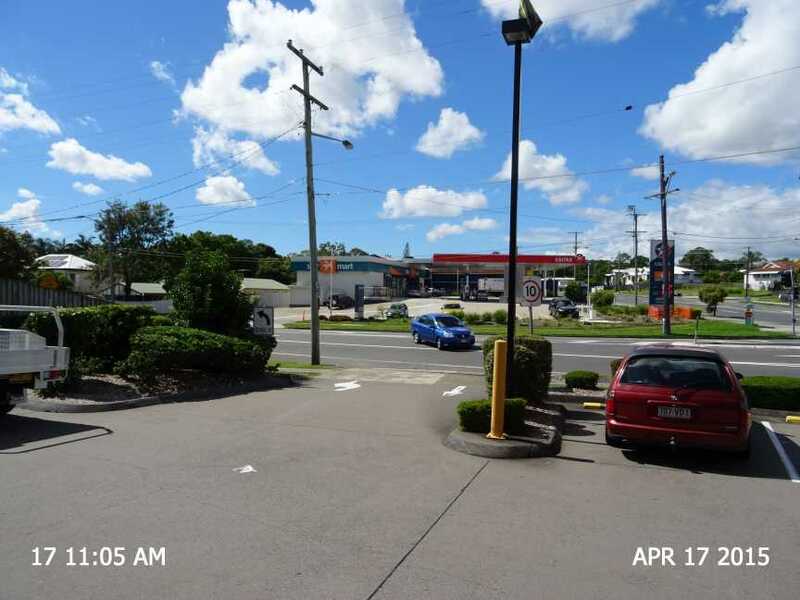 I then composed a letter to the Queensland Police Commissioner with copies to the Police Minister, Premier, Brisbane's Lord Mayor, Councillor for Traffic and Transport, and the Manager for Traffic and Transport and a copy to the leasing agent for the corner shopping complex. 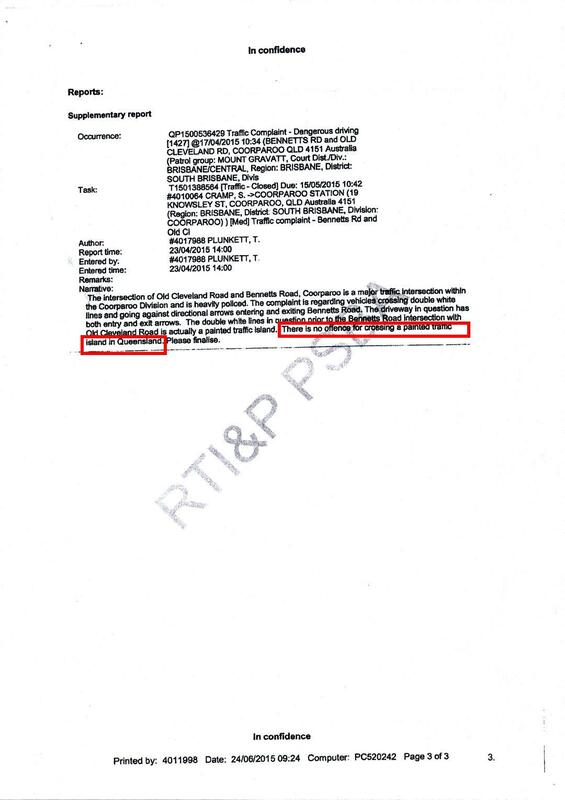 The leasing agent wrote back saying that they would be erecting a left turn sign at the Bennetts Road exit. Almost two months later it has still not arrived. The Lord Mayor response letter I received this week, written by the department suggest that they were willing to do NOTHING and it was a police matter. On the 13 November 2007 I stopped at this site for a short time and over an eleven minute period between 5:59 pm and 6:10 pm I took several photos.